As a first-time home buyer, you have several resources that you could potentially use to your advantage. The mortgage industry knows that renters do them no good. Therefore, they try to coax those that have never bought a home before into the world of home ownership. Because of this, as a first-time home buyer, you can really get some great deals. Here are a few resources that you can you use as a first-time home buyer. The FHA (Federal Housing Administration) is the most well-known source of assistance for first-time home buyers. With the FHA, you can get a mortgage with a very low down payment. Most of the time, you will only have to come up with 3 percent of the purchase price in order to buy a home with an FHA loan. One of the biggest things that keeps people from making the jump into home ownership is the required down payment. With other types of mortgages, you typically have to come up with a 10 to 20 percent down payment. Therefore, having to come up with only 3 percent is a huge advantage. In addition to the lower down payment, FHA loans also provide you with a very competitive interest rate in the market. This will enable you to get a lower monthly payment and pay less over the life of the loan. Since the loans are backed by the FHA, it is also simpler to get approved for a loan through this program. If you have questionable credit, there is a better chance that you will be able to get approved. The lender knows that the FHA is guaranteeing 50 percent of the loan, so they are a little more lenient when it comes to the credit decision. There are a number of organizations out there that offer grants and gifts for down payment assistance. Most of them depend on your income and where you live. Therefore, you will have to find the grants and gift programs that are available in your area. Talking to a local real estate agent can help you determine exactly where you could find help. With these programs, the organizations will actually give you the money that you need for the down payment on a house. You do not have to repay the money in the future. This is a great resource as it amounts to free money for your home purchase. Even if you do not go through the FHA, there are a number of loan programs out there that cater to first-time home buyers. Ask the lender that you want to work with if they have any first-time home buyer programs, and they will usually offer some sort of assistance. 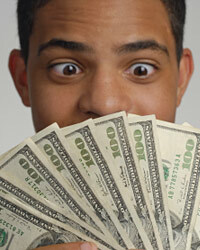 Be sure to check with multiple lenders and to compare their assistance programs.